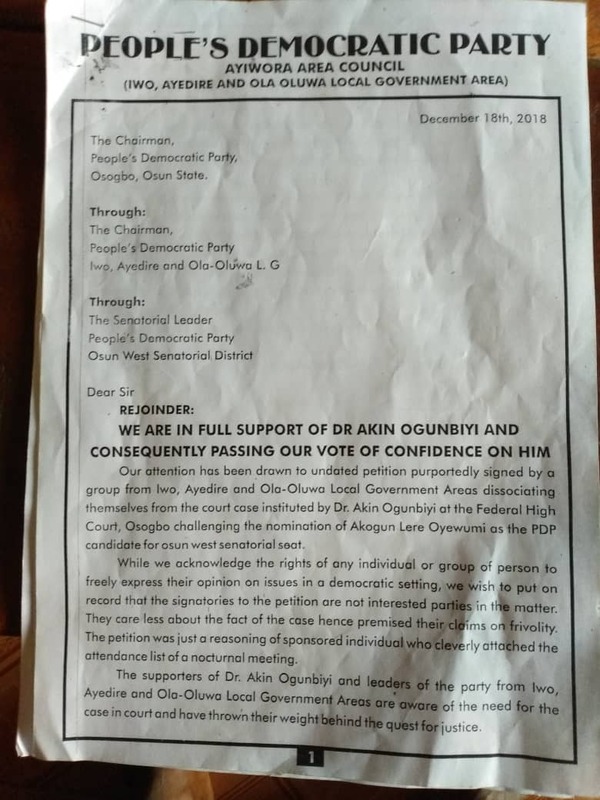 Prominent leaders and frontline members of the People's Democratic Party in Osun State have thrown their weight behind Dr. Akin Ogunbiyi, declaring that only paid agents of consent buyers were behind a purported petition against his pending suit on Osun West senatorial ticket of the party. PDP chieftains including Chief Saka Salami, Chief Jimoh Falola, Mr Iromini Adejare, Engr. Tunde, Hon Olabiran Tajudeen, comrade Rasaki Opatade and several others from Iwo, Ayedire, and Olaoluwa local government areas of the state in their jointly signed position letter - dated 18th December - to Osun state chairman of the PDP, Hon Soji Adagunodo, stated this. "Our attention has been drawn to undated petition purportedly signed by a group from Iwo, Ayedire, and Olaoluwa local government areas dissociating themselves from the court case instituted by Dr Akin Ogunbiyi at the Federal High court, Osogbo challenging the nomination of Akogun Lere Oyewumi as the PDP Candidate for Osun West senatorial seat." "While we acknowledge the rights of any individual or group of persons to freely express their opinion on issues in a democratic setting, we wish to put on record that the signatories to the petition are not interested parties in the matter. They care less about the case hence premised their claims on frivolity. The petition was just a reasoning of sponsored individuals who cleverly attached the attendance list of a nocturnal meeting." "The supporters of Dr. Akin Ogunbiyi and leaders of the party from Iwo, Ayedire, and Olaoluwa local government areas are aware of the need for the case in court and have thrown their weight behind the quest for justice." "It is imperative to state that Dr. Akin Ogunbiyi has the right to explore every legal means in seeking redress and he has the full backing of his supporters across the state. This, they (Akin supporters) demonstrated by attending the previous court proceedings in large number." "We wish to educate the author of the petition to understand that Dr Akin Ogunbiyi's prayer in the law suit is to seek the reasoning of the court of competent jurisdiction on the position of the law when a freely given contract is breached and no more." "The matter is before the court, any side attraction is contempt punishable under the law. The petitioners' action only confirmed the rumoured issue of consent-buying through paid agent."